Guest posting has flooded the blogosphere faster than anyone thought it would in the last two years. The sudden rise of the use of the tactic of guest posting raises a lot of questions and concerns. How Should You Treat Guest Posts? The Panda wave sent a lot of websites to the bottom of the SERPs. Was guest posting the problem for some of these people? Some of them definitely thought so, and many people were removing guest posts one by one until they figured out exactly what it was that was causing their website to drop in the rankings so badly. However it is obvious that guest posting is not the problem. It’s what kind of guest posts that you accept, because let’s face it, a poor guest post resembles poor “filler” content that many “content mills” use on a daily basis. What is really meant by the phrase “Content is King” is “Quality Content is King.” Panda cemented this into the algorithm of the top search engine and content that looks nice keyword wise just isn’t going to cut it anymore – people actually have to “Like” to read your content these days. All this being said, your guest posts that you accept should follow the guidelines of the latest Panda update. Do you foresee potential guest posts having any of the following qualities? If you do, then it is probably a good idea to decline the guest post. Another good idea, and a concept that is gaining popularity, is to charge $10 to even review the guest post (a lot of people donate the $10 to a charity). Many have claimed that they see instant results in the quality of the guest posts that they receive for review. If you think you have received an email template, the truth is that the quality of the content that you will receive from that person will probably not be as high quality as someone that took the time to send you a personalized email, or from someone that you know or is doing a guest post by chance. However this is not always the case, and there is no harm that can be done if you were to give someone the chance to write something up for it. You can always say no, obviously. The same is with pen names – half the time you do not even know who you are talking to or who is actually writing guest posts for you. However, if the content is good, and it is something that is going to help you in the SERPs then what harm is done? Some people just do not want their name sprinkled all over the Internet. Fair enough. This being said, nothing keeps a readers eyes glued to the computer screen like the plain old truth. People want to read content that they can trust, content that is productive, and content that was written by somebody qualified. Guest posting should not be viewed as link building first and foremost. The SEO pioneers used to build links because it was a valuable way to gain traffic – in fact one of the only ways – and not because it was a great way to improve your rankings in the SERPs, because it wasn’t just yet. This is how you should view your guest posting efforts. 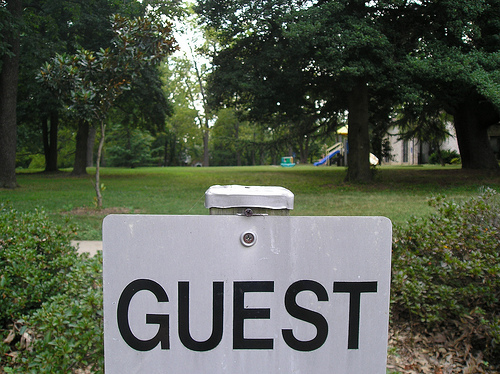 You should avoid guest posting just for the main purpose of building links. Every time you do this, your guest posts become more and more mathematically identifiable and thus may suffer someday from an algorithm change – which is exactly what Panda did to the content mills of the world.